Intern at the Passion Play! 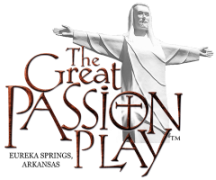 We are currently have internship opportunities at The Great Passion Play. Interns will have the opportunity to act in the Play and/or Holy Land as well as help with set prep and help out with our mission trippers. Lodging is available on site and most meals (4 dinners, 5 breakfasts, and 4 lunches in June and July) are provided. Customizable programs are available. Potential for college credit/independent with consultation. Call 479-253-5358 if you are interested, or you can fill out the form below. if you can't come, give to our Intern efforts! Fill out the form below if you are interested in our 2018 internship opportunities!